This article was written by Barbara Leech, with added information by Krystina Ostermeyer about lupus hair loss. ‘Tis the season for me to deal with handfuls of freshly fallen hair as well as snow. Once again, lupus is making my hair fall out and the number of strands lost each day is staggering. I know the volume of loss is alarming because I counted exactly how many I lost yesterday. I kept track in the shower, through combing and drying my hair and then attempts at styling — the total was 25. Not to mention I counted the ones I found on my shirt and coat and yes, even the ones I saw fall onto the floor. A total of 38 hairs lost that day — that I’m aware of. So, here is my advice if this is happening to you: don’t count them. Shockingly, lupus can cause you to lose not just the hair on your scalp, but also your eyebrows, eyelashes, beard, and body hair. Because lupus is inflammatory, the inflammation may have a direct effect on the hair follicles, causing the hair loss. In fact, this inflammation so often causes hair around the hairline to become frail and thin that it breaks easily, that it has its nickname – lupus hair. 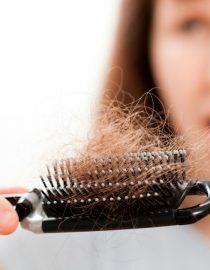 Hair loss may be one of the early symptoms of lupus. Unfortunately, hair loss can be a symptom of many other diseases and disorders, so this one early sign does not always result in an early diagnosis. The type of lupus. Certain types of lupus are more likely to cause hair loss than other types. For example, lupus of the skin (cutaneous lupus), which can be further broken down into either discoid lupus or subacute cutaneous lupus, is most likely to cause lupus. However, the damage is reversible once treatment begins. Other types of lupus can cause lupus, depending on other factors. Medications. Typically, there are two types of lupus medications that are associated with hair loss. One type is corticosteroids – you may have heard of the drug called prednisone. It is a powerful anti-inflammatory medication, but it can come at a cost, and that cost is your hair. Another drug type is immunosuppressive medications, of which there is a lot. These medications are designed to suppress the activity of the immune system, but that can also mean a loss of your hair. My hair is one of the things that lupus has stolen from me that impacts how I view myself and present myself to the world. Hair loss can settle into that quiet corner where your confidence lives and clean house. For the most part, I try not to focus on it, because that would be pure vanity, which is not a dominant force within me. But I am human, and female (and we are judged by our lovely locks whether we like it or not) so now and then horror hits me as I consider how many hairs I hold in my hands, find in my comb or scattered about my house like some shedding beast resides there. For me, lupus is that horrible beast, and it attacks my hair follicles for about four to six months of every single year. Right now, I find it hard to look in the mirror and be ok with what I see — in the morning, after sleeping on my thin, crazy tresses, they resemble those of a cancer patient. I have not found there to be a regular, predictable pattern to the hair loss months either. This particular type of lupus attack seems to hit long before a full-blown flare strikes, and the only thing I can count on is it will get worse before it gets better, and it will last for at least four months or maybe even longer. Next page: Tips for preventing, managing, and treating lupus hair loss. @Tammie Weaver, Tammie my scalp was so damaged by the lupus during a bad flair I was having at the time that it couldn't grow back, that might not be the case with you. You should talk to your doctor, if you haven't already. I pray you don't have the same hair fate as I do. God Bless You and stay strong. @Sandra Bilodeau-Declare, Thank You for the information, I will check it out. I pray it continues to work for you. May God continue to give you the patience and strength you need each and every day. Started losing a lot about a year ago. Was diagnosed 7 years ago. I don't know if it's loss of minerals & vitamins or not following Lupus diet. Quite depressing, I'm also having hormonal issues. Unfortunately yes. Having a flare up now. Hopefully it will stop and I'll have time for new hair to grow before next flare up. OMG,YES! I hate it, it falls out at a moments notice flare or no flare...a never ending struggle. I was hospitalized for 10 days in February and once released started losing a lot of hair. Was diagnosed 5 years ago and this has never happened before.